Don Moe's Travel Website | Documenting my motorcycle journeys around the United States and Canada. Starting in 2011 I’ve documented my journeys on my motorcycles, initially the 2010 Kawasaki Concours 14, followed in 2013 by the 2013 Triumph Trophy SE, which replaced the Concours after my accident in August 2012.
overlooking Lake Okeechobee at Port Mayaca. 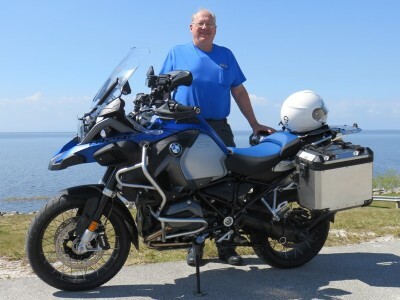 In January 2015, a 2015 BMW R1200GS Adventure motorcycle joined the Trophy SE in my garage. In the future I expect to alternate between the BMW and the Triumph. In the menu bar with drop-down sub-menus under the banner photo of Monument Valley, you can directly access several sections of the site. Click on any menu item to quickly navigate to that section. For a bit of biographical information, please visit my About page. The sub-menus link to pages related to my cameras, GPS, and motorcycles. Thus far I have completed five major cross-country tours, which I have called Summer Tour 2011, Summer Tour 2012, Summer Tour 2013, Summer Tour 2014, and Summer Tour 2015. On their main pages I have included some introductory information as well as a chronological index to all travelogue reports. In August 2012, I started on a trip to New England and eastern Canada, which was going very well until an accident in southeastern Ohio. The interrupted trip is documented under Autumn Tour 2012. Since starting in 2010 to ride motorcycles again, I’ve been tallying up the number of US states and Canadian provinces that I’ve visited by motorcycle. During my 2015 tour, I finally accomplished the goal of visiting the final three states (Delaware, New Jersey, Alaska) in the 49 continental US states, leaving only Hawaii to do someday. These two maps graphically indicate the states and provinces that I’ve visited thus far. To read my travelogue postings in chronological order, please start reading at the first entry in its corresponding index. At the top of each page are links to the next and previous entries. To find a specific entry of interest, please look for it in the travelogue index. Another section, titled Other Trips, contains descriptions, maps and photos from shorter trips that I have taken, such as to events around Florida or to motorcycle rallies in the Smoky Mountains. After attending the RawHyde Adventure Riders’ Training Course in Hartsel, Colorado, I published an article about the experience and also posted it here. For each tour I provide the sub-section Additional Photos, where nearly all of the photos taken during the tour are available and organized into sub-menus by state or geographic area. Each photo page also includes a map of the area of interest. A chronological index to all maps from each tour is provided in the Maps sub-subsection.